Scene: Five hikers stand on a small grouping of exposed boulders in the middle of a snow field, dripping wet and alternating between screaming and swearing. They’ve just crossed Wide Creek and the pain that signals the return of feeling into their feet and legs has started. They aren’t concerned with disturbing anyone with their noise, so few hikers have ventured out for this section that they go days without seeing anyone else. Welcome to the Sierra section in the very special year that is 2017! 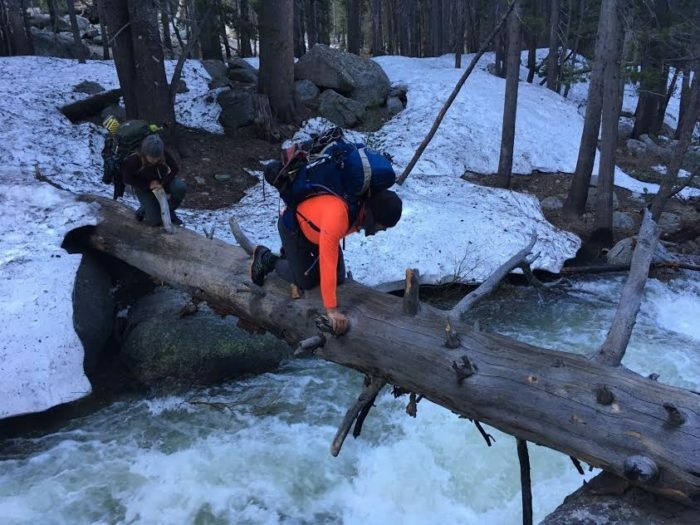 If you managed to make it through the High Sierras, with the immense snow pack and high elevation passes, you get rewarded with the Low Sierras, incredibly waterlogged as the snow melt works its way down the mountains. We’re currently in South Lake Tahoe (mile 1090) letting our shoes dry out for the first time in two weeks; it’s been wet, very wet. 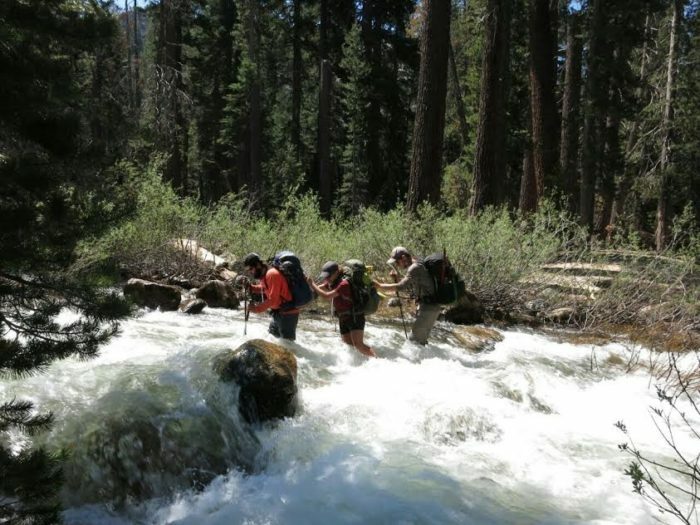 We’ve regularly forded through thigh to waist deep water, whether it be a slow moving creek containing ice chunks that float past you as you wade through, rivers with fast moving white water, or fresh new streams not indicated on the maps. In between these major crossings the trail itself is often under water (when it’s not under snow.) The good news? Even with all this, we still made it through and got much better at water crossings as we went along. Here’s how. This was absolutely the case with the creek in Kerrick Canyon, one of our major concerns for this section. It was wide enough to cover the entire canyon floor and, from the few miles we saw, all deep white water. We followed it along until we saw an avalanche zone, which had caused a large tree to fall across the river, spanning about half the width. From there, one final snow bridge was accessible a few feet away for a mostly dry crossing. Snow bridges. As the elevation increases the chances of finding a remaining snow bridge also greatly increases. Feeder streams. As you move upstream you will likely cross over several of the feeder streams of the water crossing, which means less water in the actual crossing. Flattened topography. 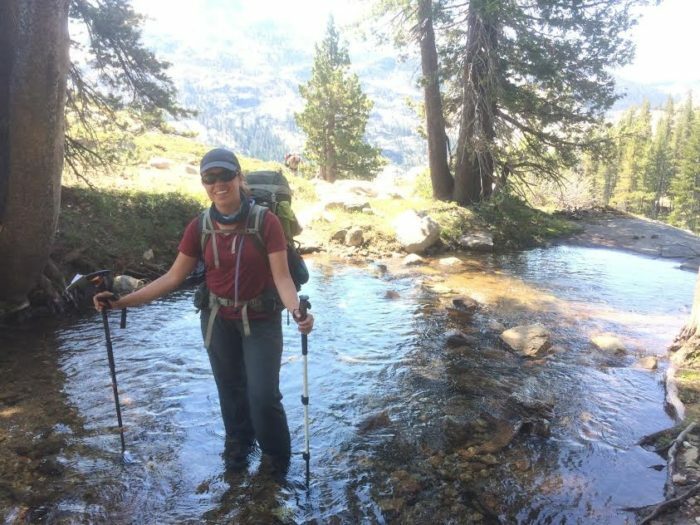 If the water is moving too quickly to be safely crossed at the trail, look for a flat spot upstream where the water will have room to spread out and be slower moving. As the snow at high elevations freezes over night, the snow melt runoff slows down and, subsequently, water levels drop. From what we saw when camped near a river or stream, there was often as much as a full foot difference from evening to morning. We tried to time our major water crossings for the mornings when possible. When the water was moving too quickly for a single hiker to shuffle across on their own, we used the I formation to get across. In this scenario, 3 hikers cross together with the largest hiker in front. The smallest hiker then positions themselves behind the first, largest, hiker and holds on to that hikers pack, and finally the third hiker stands in the back holding onto the second, smallest, hikers pack. With the first hiker facing the current, the group then shuffles across the water in unison. We found pre-discussed verbal commands helpful with this method. The hiker in front (in our case, Dan) would shout out “1” when he took a side step with one foot then “2” when he brought his other foot over to meet it, allowing those of us behind him to match his steps. The 2 of us in back then would shout “hold” if we needed a minute to correct our footing or “pivot” if we found ourselves stuck behind a boulder or other obstacle we couldn’t sidestep over. In the case of Wide Creek, mentioned in the beginning of this entry, we used a combination of these tools to cross it. When we first met it at the official crossing point, the combination of it’s depth and speed was beyond our comfort level. We then followed it upstream for about 3 miles, forded one of it’s major feeder streams, and crossed it the next morning using the I formation. It was still a challenging (and cold) crossing, but better for having these tools. For other PCT hikers coming behind us, a friendly reminder to update the Snow and Ford report (http://www.pctwater.com/) with information on what you’ve seen out on the trail. To those that have been sending in their updates, thank you; your information has made our experience much smoother. Safe travels everyone!